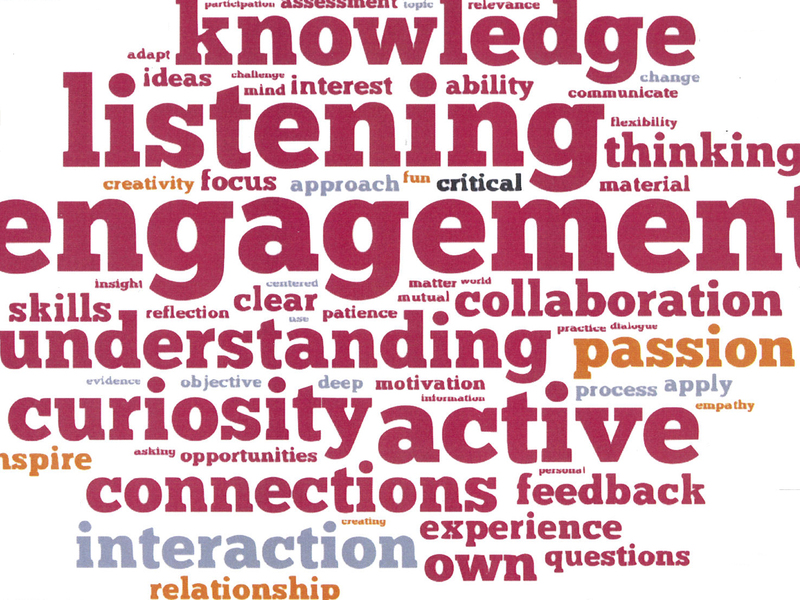 A word cloud disseminated at the HILT conference captures participants' views of the ingredients essential to learning and good teaching. The 2013 Harvard Initiative for Learning and Teaching (HILT) conference, which nearly filled the largest Science Center lecture hall on May 8, demonstrated wide interest across the University in improving pedagogy. Ever since HILT was launched in the fall of 2011, during Harvard’s 375th-anniversary celebration, it has catalyzed campus conversation on cognition and learning, course and curriculum design, classroom spaces, educational technology, assessment, and more, through an annual symposium and a series of innovation grants to faculty members. This second symposium—addressed by both the president and the provost, and attended by several deans among the audience of hundreds—suggested the variety and reach of educational experiments under way involving professors in every Harvard school, and their hundreds or thousands of students. Although the edX and HarvardX online ventures, formed in May 2012 and scaling up operations during the past year, have ridden a national wave of interest in massive open online courses (MOOCs), HILT, operating more quietly and less visibly, likely now engages more faculty members and students in efforts to enhance education in campus classrooms. At Harvard, Driver-Linn said, she discerned a spirit of innovation ranging from edX to new curricular and course offerings, from deans to students, and in the 50 or so local faculty experiments supported by HILT grants. Throughout, she explained, the aim was “innovation informed by evaluation and grounded in practice”: drawing on the faculty’s intellectual capital, insights from cognitive science, and support from the University’s leadership—and shaped not only by a commitment to analytical assessment but also by the surrounding educational culture of the institution. Innovation, she made clear, was a choice exercised by the participants. The conference aimed to identify the essential elements framing such choices, and the essential traits of the University that must be sustained even as it pursues change and improvement. The three psychologists on the first panel addressed aspects of cognition and learning. Collectively, they emphasized the importance of practice and cumulative engagement with a subject in order to learn it, and of perspective on the part of teachers who need to know what their students don’t know—in order to help them learn. Daniel T. Willingham, Ph.D. ’90, professor of psychology at the University of Virginia, and author of the Science and Education blog, drew on various experiments to demonstrate that critical thinking—the desired outcome of so much learning and education—“is hard, it’s taxing” and “It’s not obvious that it’s going to pay off.” When presented with a problem, most people consult memory to see how things worked out in the past. An experiment demonstrated that students who took a semester-long course in structured logic in fact registered no gains in solving a standard logic puzzle. Willingham reviewed difficulties with the kinds of information a person might use in trying to solve a problem, and in understanding the hidden structure of the problem at issue. The best way to overcome such challenges, he said, is lots of practice. Physics professors understand what kind of problem is being raised in a quiz; first-year students, even after a course, do not. The difference is practice. In educational terms, that means that “development of critical thinking is really a curricular issue”: looking beyond an individual course to the deep, recurrent problems of critical thinking in a field or discipline, and devising a curriculum that cumulatively teaches students how to identify and approach such problems. That is how memory is trained to be an ally. This insight implies that courses designed in isolation are likely to be ineffective, compared to thoughtfully sequenced courses as part of a larger curriculum—a challenge to departments and professors to go beyond individual units of instruction. Katherine Rawson, associate professor of psychology at Kent State University, who studies learning from texts and strategies that promote durable learning, offered a different but complementary approach. She said that as students progress through K-12 education and beyond, they are increasingly asked to learn more content, and to do more of their learning outside the classroom—but they are given ever-less guidance about how to learn. Among the techniques students might use to learn material, those most deployed—rereading, highlighting texts, and so on—are decisively the least effective. Those that are most effective—self-administered testing (for example, she joked, via the “f” word—flash cards) and various forms of practice—are least used. She offered evidence of the efficacy of “successive relearning” of foundational knowledge in a field: drilling oneself on concepts or new foreign-language vocabulary initially introduced in a class, for instance. The gains from various exercises (repeated sessions in a language lab, for example), evaluated on quizzes or subsequent examinations, were enormous: a demonstration of a kind of practice, although in a context different from the critical thinking Willingham analyzed. Because students don’t use such techniques on their own, Rawson said, teachers have to help them do so. Her course study-guides identify key concepts and suggest a schedule for such practices, regulated by the students themselves, to help them master and retain material in a way that exam cramming has been proven not to do. What can one do to overcome this bias? “Not very much,” he said. People become conditioned by their context and knowledge. “I cannot ever fully invite you into my mind, I can’t ever fully inhabit yours,” in other words. Skillful teachers have to take that into account as they engage precisely in the task of trying to get something from within their own minds into another person’s. As Rawson might put it, teachers have to take the deficiencies in their students’ learning skills into account, and point them toward more effective practices. For Roberts, these were some of the fruits of “teaching strategic patience” (what others today might call “time management,” she joked, or “patience engineering”)—and of giving students permission to slow down and exercise their unknown faculties. The challenge for a harried Harvard faculty member, she said, was to model this behavior without showing how frazzled she could herself become from the demands of teaching, research, and the rest of contemporary life. Psychometrician Andrew Ho, assistant professor of education and research director of HarvardX, made the case for the role of testing and assessment in support of the art of teaching. In an era of rising criticism of tuition costs and demands for more value from education, he said, testing was good offense. He observed that it was difficult to plot with any certainty his own (hoped-for) improvement in teaching from year to year. And yet, he suggested that by drawing on the resources of the Bok Center for Teaching and Learning (newly under the direction of Robert Lue, who is also faculty director of HarvardX), offices of institutional research, registrars (who could provide information on the students in a class and their pedagogically relevant backgrounds and preparation), and assessment experts, faculty members ought to be able to devise pertinent, productive metrics of teaching performance. The final speaker, Jonathan L. Walton—Plummer professor of Christian morals, Pusey minister in the Memorial Church, and professor of religion and society—delivered a stem-winding sermon on the importance of passion, and not simply expertise, for teaching. He told how his parents prepared for a fish dinner: his mother drove to the local Winn Dixie supermarket—but his father phoned a buddy, readied his tackle, drove to Florida, chartered a fishing boat, and, as often as not, after failing to hook anything, swung by the supermarket on the way home. His mother was expert, but his father was passionate, Walton recalled, and he learned far more from his outings with the latter. Harvard School of Public Health dean Julio Frenk surveyed his faculty’s centennial-year review and revision of its curriculum, predicated on adapting the best of several options for its use, rather than overturning its methods entirely. Instruction was being designed around competency-based learning, with flexible, modular, experiential units accommodating students at various times in their professional lives. And it embraced “blended” online and class-based teaching techniques. The mix of online and face-to-face instruction, he said, varied with the purposes, with more online teaching for “informative,” expertise-oriented learning, and progressively more personal instruction for “formative” (values and professional) and “transformative” (leadership) courses. He then reviewed the institutional challenges: colleagues (investing in faculty development); capacity (physical space, technology, finances, and so on); and culture (changing from language that describes a professor’s teaching “load” to give teaching a value equal to research; the rewards for teaching and research; and the school’s self-identification as a preeminent research institution). The final speaker, Nan Keohane, was the consummate institutional expert panelist: president emerita of Wellesley College and Duke University, member of the Harvard Corporation, and now Rockefeller Distinguished Visiting Professor at Princeton’s Woodrow Wilson School, where she teaches leadership. Drawing on her recent article, “Higher Education in the Twenty-First Century: Innovation, Adaptation, Preservation (PS:Political Science and Politics, January 2013), Keohane briskly listed attributes of higher education worth defending in the online era. the beautiful campuses and physical spaces that many institutions have built (along with their treasured collections in libraries and museums). “the community of teachers and learners” (where scholars can convene, learning from each other, virtually, but also, at least occasionally, in person). After Diane Paulus, director of the American Repertory Theater, led an interactive summing-up exercise, the conference attendees gathered in the large tent on the newly renovated Science Center plaza, the most ambitious of the University’s new “common spaces,” for refreshments, an “innovation fair” exhibiting nearly four dozen HILT-funded educational experiments, and concluding remarks by President Drew Faust. Assuming that HILT’s efforts to seed and support educational innovation flourish, Driver-Linn will need to find a bigger venue for next year’s conference.